Who wants to deal with scaffolding and and clambering around on top of a roof nailing shingles? That's a rhetorical question of course. It's tedious and time consuming to build scaffolding and put a roof together two stories up. So we bypassed all that difficulty by building the complete roof, trusses, shingles and all, on the ground! 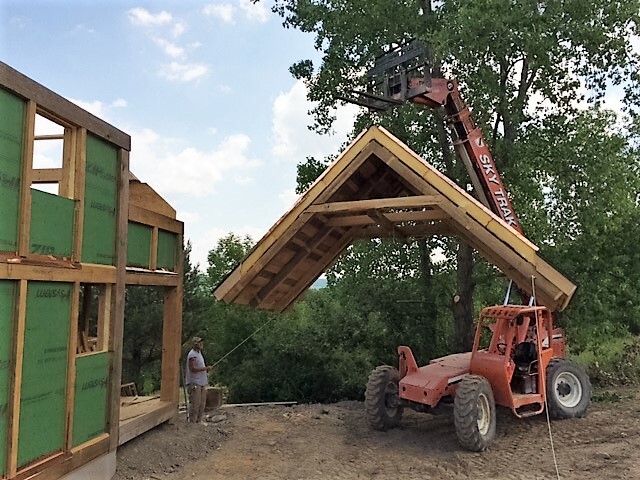 We then lifted the roof into place like a gigantic hat. Take a look! With every new innovation we utilize, construction gets faster and more efficient!